Baking Partners,as I mentioned in my Pumpkins chocolate chip muffins had suggested three recipes out of which this is the second mentioned recipe and suggested by me from Made just Right and the original recipe makes 24 cupcakes.I have halved the recipe to make 12 and the halved measure are listed below.Thanx Swathi @ Zesty South Indian Kitchen for the wonderful opportunity and am happy they tasted awesome.My kids just loved each bite of the cupcakes.The recipe calls for apple cider vinegar and I think that enhanced the texture of the cupcakes as they were extremely soft like pillows (see pics for texture).My kitchen was filled with the aroma of spices,when baked.The butter cream frosting is also spiced.So,if you have pumpkins resting in your pantry after your pumpkin patch and carvings,do try this out for your dear ones !! -Preheat oven to 350 degrees F, and line 12 cupcake liner in a cupcake pan.Spray vegetable oil lightly. - In a medium bowl, sift together flours, spices, baking soda and powder. Stir to mix together and set aside. - In a stand mixer (or with a hand blender) cream the unsalted butter until smooth and creamy. -Add in the brown sugar, cane sugar, and vanilla extract and mix on a higher speed until fluffy. 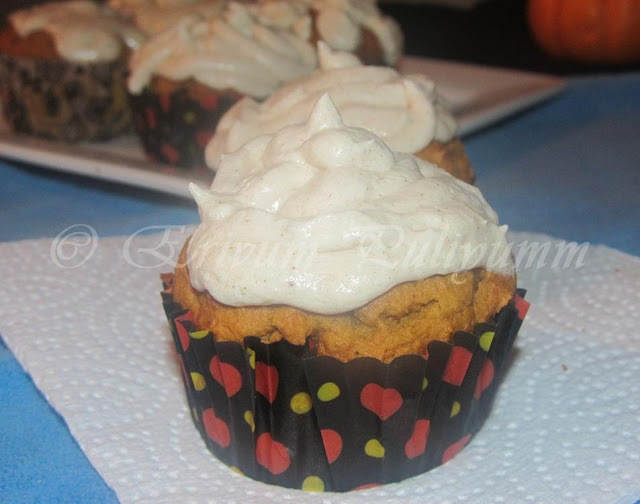 - Add in the pumpkin/squash puree, salt, vinegar, and half of the soy milk/whole milk. In 1/2 cup increments add in the flour/spice mixture, also adding in the remaining soy milk in between additions. Be sure to stop the mixer and scrape down the sides of the bowl and give it one more good mix to be sure all ingredients are well incorporated. -Remove from oven & cool on wire rack.Cool completely before frosting. -Use a mixer to cream the unsalted butter until smooth. Add in the vanilla extract, maple syrup, and soy milk/whole milk and mix until combined.On a low speed, slowly add in the powdered sugar and spices and mix well after each addition. Keep mixing until all is well incorporated and the frosting is smooth and fluffy. -Use a ziploc bag or pastry bag to make designs and patterns.I was short of time(as kids were waiting eagerly) to draw designs and had to finish scooping with a zipoloc bag and so no patterns. * You can use all purpose flour alone but I have used wheat flour 1 cup + all purpose flour 1/2 cup increasing the baking soda to another 1/4 tsp more. * I have used regular whole milk. 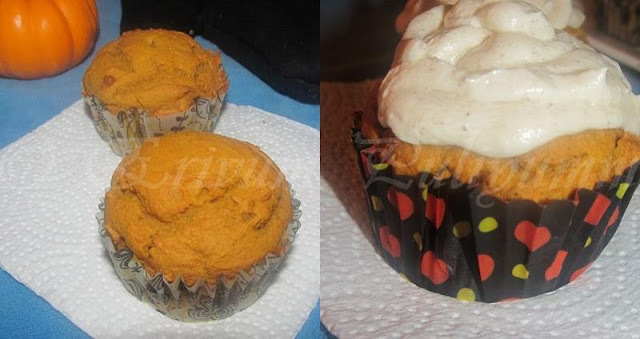 * I used canned pumpkin puree,but you can use homemade pumpkin puree too. Yummy Cupcakes.. They are cute.. Loved your eggless version Julie. Very perfect and cutie cupcakes dear. Delicious cupcake love that eggless version I was out of time, That is why I couldn't try this, Sure going to try when I get the time. 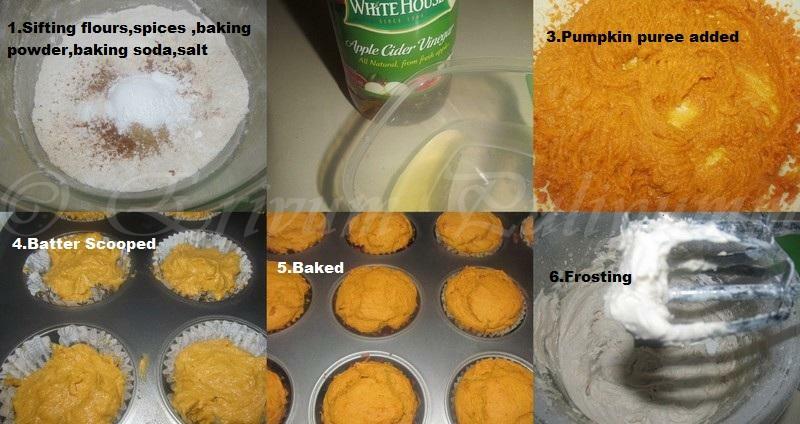 Nice Pumpkin muffins. Looks very nice. The cake looks so moist. You have really got into the spirit of Halloween. I'll be making this cupcakes soon, they came out extremely spongy. i always used to think how can cupcakes made of veggies taste gud?? ur looks amazing!super! Perfect for fall...looks super moist! Moist and soft muffins with yummy frosting!! Eggless cup cakes look yummy and moist. Thx for linking. 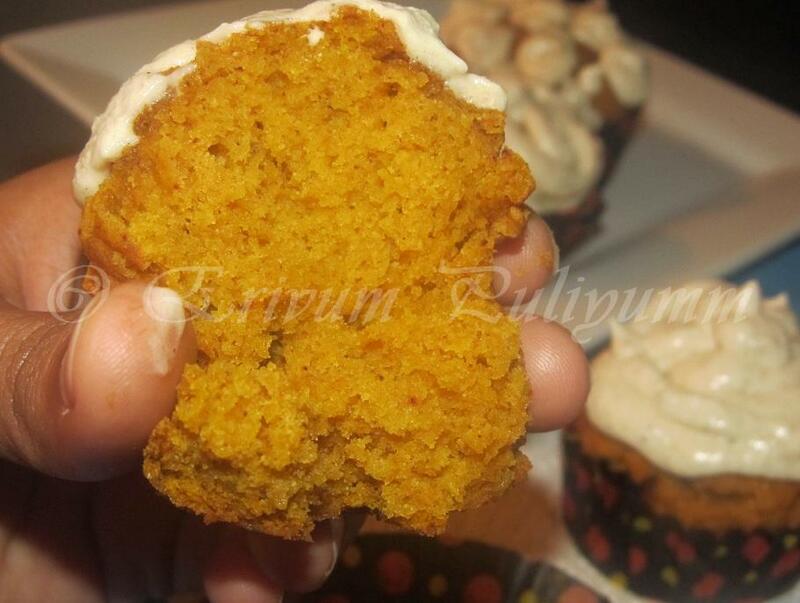 Whenever I see recipes of pumpkin cakes / bread, I always wonder how the two go together 'coz I have never tasted one. Your cupcakes look absolutely delicious!! Cupcakes look perfect and yum.. The cupcakes are looking awesome.. Thanks for linking it to my event!! Looking for more yummy recipes!! Please add the link to Kiran's page and the event logo..